Map of Manila and Vicinity. 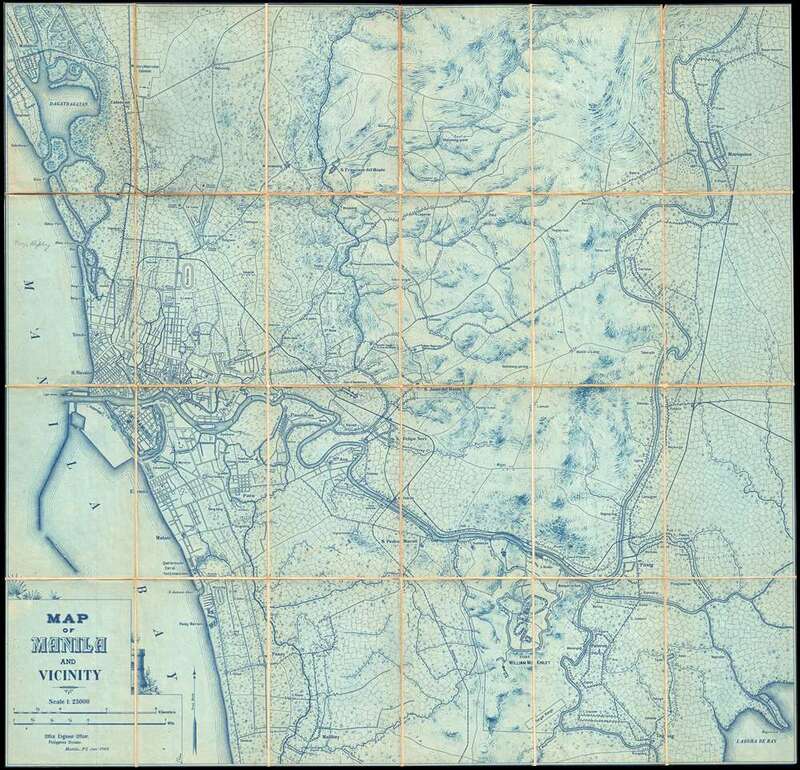 An unrecorded 1905 cyanotype U. S. Army Engineers map of Manila and vicinity, the Philippines. The map illustrates the Manila region shortly after the Philippine-American War (1899 - 1902), when the United States assumed control of the Philippines after over 300 years of Spanish rule. The United States was eager to develop its new colony with modernized infrastructure, including new railroads, communications systems, and an electrical grid. The map covers most of what is today metropolitan Manila, but was then a city of about 220,000 with development primarily confined to the old Spanish city, today's Intramuros. Some of the surrounding villages have since been integrated into Manila, such as San Pedro Macati, now the wealthy Makati City district. The full coverage of the map extends about five kilometers inland from Manila Bay, reaching to Laguna Lake in the southeast, to Malibay in the southwest, to Mariquina in the northeast, and Malaban in the northwest. The map offers considerable detail, noting individual buildings, farm fields, and topography. Fort William McKinley (today's Fort Bonifacio), then the epicenter of American military might in the Philippines, appears in the lower right quadrant. A pencil annotation in the upper left corner identifies the original owner of the map as Major Ripley. This is without a doubt Major Henry L. Ripley (1864 - 1944), a U.S. Cavalry officer and commander of a detachment of 'Ilocano Scouts,' mounted indigenous Philippine counter-insurgency troops named after the Ilokanos or Iloko peoples who composed the majority of the force. The Ilocano Scouts, with their intimate knowledge of the terrain and language, proved instrumental in suppressing anti-American guerilla factions active shortly after the war. Although they effectively quashed the rebellion, the Ilocano Scouts acquired a reputation for 'cowboy tactics' and excessive brutality. General Frederick 'Fearless Freddie' Funston, a senior American commander in the Philippines, had an ill opinion of the scouts and their American commanders, calling Ripley and his confederates, 'addicted … by reason of their untamed natures, to brutality.' This map, which is dissected and mounted on linen, was no doubt a valuable resource for Ripley, who would have used it for strategic and tactical purposes. This map is cartographically derived from the 1901 US Army Corps of Engineers map of the same region, also entitled, Map of Manila and Vicinity. The present map offers a considerably expanded scope and countless content updates throughout. The fact that it is a cyanotype, suggests that it was made in small quantities in the Philippines for use in the field. It also explains the map's rarity, as no other examples are known to survive. Very good. Dissected and mounted on linen. Original linen backing split and reinforced in places. Folds into original binder.